MySQL to MS Access Database Converter Software empowers users to convert database records created in MySQL format to MS Access database. Database Conversion program supports value constraints, key constraints, data types, schemas, attributes, tables (rows and columns) while converting database from one format to another. MySQL to MS Access Database Converter program allows user to overwrite the records of existing database records with the converted database records and provides option for saving converted database records at user specified location for future usage. 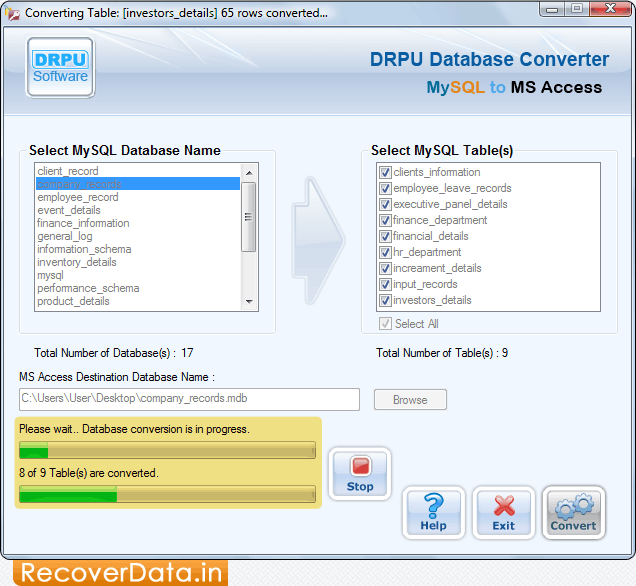 Database Converter software converts database records created in MySQL to MS Access database format. Provides option to convert selected individual tables or entire MySQL Database records as per your need. Supports major MySQL as well as MS versions. Convert indexes with all necessary attributes. Allows you to quickly convert password protected MySQL database records.